Many companies continue to struggle when making their move to cloud because they are forced to sacrifice the clear visibility Don Barclay Authentic Jersey and convenient Don Barclay Jersey control they are accustomed to Don Barclay Kids Jersey getting Don Barclay Womens Jersey from their local Don Barclay Youth Jersey data centers. See how iland’s Enterprise Cloud Services portal (Summer 2014 update) and mobile app enable teams to easily monitor and control their cloud costs and resources on the go. 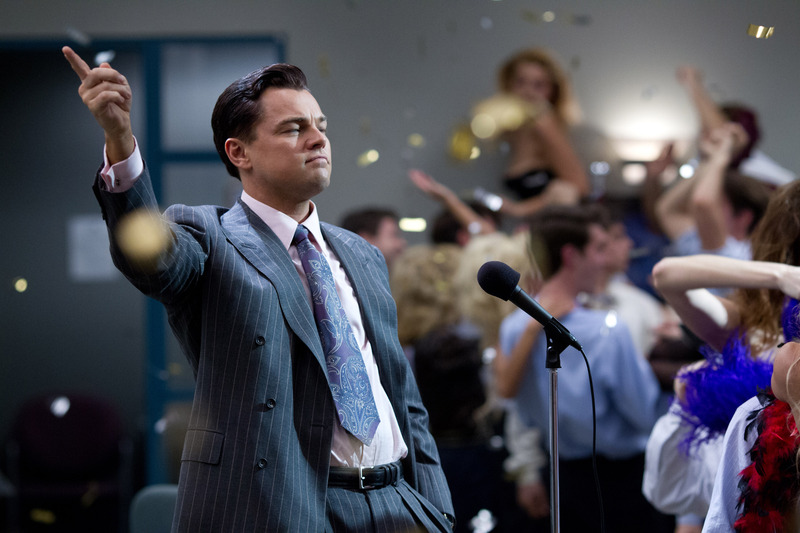 We know a Sales Executive who once found what he thought was the equivalent of the Glengarry leads on steroids. It was early February and he was in line to close the two biggest deals in company history. For him, it meant retiring annual quota with almost 11 months left in the year! Yes, this is an extreme example of how a high pressure focus on one’s quota can sometimes blind us to what’s going on around you. It does however happen more often than most people realize. Corporate sales quotas are a way of life for most sales people and frequently it can lead to an uncomfortable life. The fear of not making quota and the potential job loss that may accompany it is undoubtedly even more common. – Quotas can add significant pressure to the salesperson, which may affect his ability to sell with relaxed confidence and enthusiasm. – Possible high turnover if talented sales people fail to meet quota. – Potential for salespeople to get too aggressive with prospects. Salespeople motivated too heavily on sales volume may naturally become pushy and persistent, rather than helpful, with prospects. – Shared quotas across multiple sales roles; Account Manager, Product Specialist, Channel Managers. Thus allowing for greater shared responsibilities and accountability. – Effective quota setting in technology companies requires that sales be tracked at multiple levels (e.g., product, territory, and region). The primary example is the increased use of third party channel partners where tracking sales and giving credit where credit is due is becoming even more challenging. – A recent trend in the high-tech sector is the increased use of subjective measures (e.g., MBOs) with longer time horizons for business development sales reps. These sales reps are engaged early on with customers to gain insight into demand trends earlier on in the product life cycle. The idea is to get their sales reps closer to end users to partner up the product life cycle chain, with the ultimate goal of seizing “design win rights” early on in the sales process. With design win rights, these high-tech companies can become market makers for new product functionality instead of followers. We share Mr. Herman’s belief that these approaches can be highly successful and have experienced our own personal success with the first two examples. The third approach, while we have not seen this in action, seems almost intuitive in the way it engages the customer on a different level, early in the sales cycle. We just wonder are today’s technology sales leaders willing and able to try something new? IT’S PARTY TIME WITH A NEW VENUE! 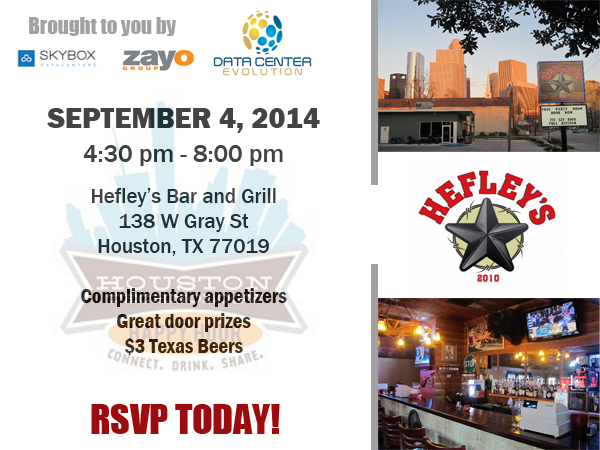 Don’t miss out on your chance to meet some of Houston’s most influential IT professionals during the triumphant return of the Houston Technology Happy Hour to Hefley’s Bar & Grill! For those that have endured the outdoor patio at our previous events, rest assured the A/C will be blowing cold at Hefley’s! For those that have joined us at Hefley’s in the past, you know we’ll have a reserved upstairs private bar, private restrooms and a great outdoor wrap-around balcony granting some amazing views of the Houston skyline at dusk. Special thanks to this month’s sponsors, Skybox Datacenters and Data Center Evolution. More info on them below. Complimentary appetizers will be served with a cash bar and friendly staff where you can order all your Texas favorites. Get this! It’s just $3 for Texas beers and $3-4 Texas liquors! This is an exclusive Thursday night promotion just for our group! Thank you Hefley’s! Door prizes will be given away, too! So, what are you waiting for? RSVP right now! This event will sell out! 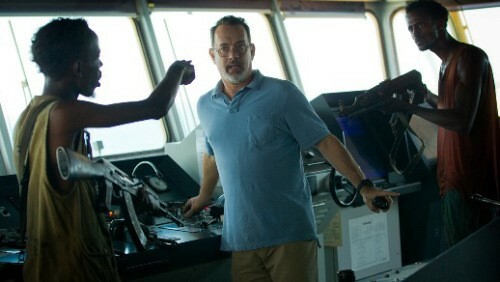 “I’m the Captain Now” – that famous scene based on that all too real life situation that took place off the coast of Somalia in April 2009 brings to mind a business parallel around what some call “vendor-lock”. Now rarely is a vendor going to point deadly weapons directly at a customer and claim they are in charge but that feeling of shock for a customer that feels they are stuck in a negative working relationship for business critical services they can’t escape can sure Damarious Randall Authentic Jersey get the blood pressure up. Why does this typically happen and what can be done to avoid such negative situations? Too often an initial contract negotiation can start the relationship off in a bad place and even create personal issues that can haunt later negotiations long after the ink on a Master Service Agreement is dry. Entering into a working agreement for critical services should always be performed with a “win-win” mentality from both sides of the table. If you don’t feel the vendor will operate with this mindset or that they simply don’t care about your positions on matters – then you should seriously question if they are the right partner. This being said getting vendors to agree to terms, pricing or items that truly are not in their best interests may feel like a win in the short term but can lead to painful situations down the road. Think about it this way – do you really want to be the customer that “won” a negotiation that makes you the least profitable customer on their list when you are relying on them to perform tasks critical to your business? Even with the best “win-win” mentality it is critical that the customer bring contractual expertise to the table on the actual services being provided. Just because one is a good lawyer or a good negotiator does not mean they have a clue about the nature of a technological service contract especially if the service is relatively new to the marketplace. Spending money to have an external consultant or outside legal counsel experienced in doing the specific type of contract is absolutely worth it. In many circumstances one misstep could be very costly in an MSA / SLA review and these types of documents can vary dramatically in a lightly regulated marketplace like technology services. The vendor has an intimate understanding of these agreements as a result of negotiating them on a daily basis. It is in the best interest of your organization that you engage with someone who can at least interpret the intent of the terms your entering into. Having strong personal relationships and dialogue with personnel at multiple levels of a critical service provider’s organization can bear positive results in many facets. This really should be a cultural initiative. In all actuality many vendors are simply more important to the business than departments full of employees. Businesses surely don’t plan to have contentious relationships with their own folks – but all too often blunt force policies of negotiation and dealings with critical suppliers are the tactics deployed to reach some objective which is typically short sighted. Merger & Acquisition activity is a constant part of life in today’s rapidly changing business landscape – especially in the technology sector. People simply don’t stay in one place for as long as they used to either. Maintaining a consistent working relationship with a critical vendor becomes even more challenging when the people and often the company itself changes completely. A change in the actual ownership of the vendor needs to always be considered. Language in your agreement should also take into account the potential for this type of change. This typically falls under the heading of Subordination and Attornment in your agreement. Part of the expertise of entering into a Damarious Randall Womens Jersey contract is understanding not just how you legally terminate it Damarious Randall Youth Jersey – but also how you functionally terminate it if need be. All too often the cost or even the feasibility of moving away from a service is prohibitive or practically impossible if there is not proper and consistent planning. One should not be caught in this situation without truly understanding what it may do to the working relationship and the type of leverage it may give to the wrong vendor. Even if a customer does all the right things up front and maintains a great relationship – things can indeed change and you get caught looking like Tom Hanks with his hands up – losing control of his ship and crew. Is it possible that we have seen a dramatic shift in sales negotiations strategy over the last 2 decades, and if so, what might be the cause? There are a several possibilities. In June 2013 the Ethics Resource Center published a new study that showed unexpected and disturbing findings that may portend a future downward shift in business ethics. The new report titled Generational Differences in Workplace Ethics examines the differences in attitudes toward ethical issues among four generational groups. Most importantly, the report states that younger workers are significantly more willing to ignore the presence of misconduct if they think that behavior will help save jobs. “Willingness to ‘let the ends justify the means’ seems to have a strong inverse correlation with age,” according to the report. Other studies have also shown that the reason unethical behavior occurs is because of the absence of punishment for committing the act (Zey-Ferrell and Ferrell). Individuals are more likely to participate in unethical behavior when they are rewarded for the conduct. Sales, which provides direct rewards in the form of commissions for sales closed, is highly susceptible to this type of behavior. 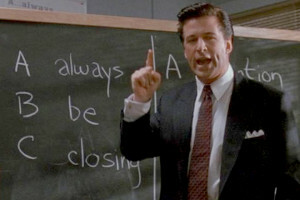 This especially true if sales management supports and encourages an attitude of “whatever it takes” to close a deal. While it is easy to speculate on the causes of this behavior, in most situations the individuals involved didn’t actually believe that their behavior was unethical. They believed that their behavior was more indicative of persuasion than manipulation. I believe that it is more likely that they fell into a psychological trap of obedience to authority which overrode their own judgment on the matter. The end result of this particular type of behavior is that the buyer is left with incomplete or incorrect information on which to make their decision. This could easily lead to poor decision making which create a huge risk to the buyer’s organization and to their own careers. Whatever the case, I believe this type of behavior is cause for concern among those of us who need to make decisions regarding the acquisition of new technology. For me personally, this concern became a major influence in my recent decision to pursue a second career in consulting with Kiamesha Global. We will seek to find ways to avoid this dilemma in future discussions here at Kiamesha Global. Colocation by definition is simply placing more than one party together within a data center facility. What we are seeing today though is far from organizations just being neighbors sharing power and cooling infrastructure. 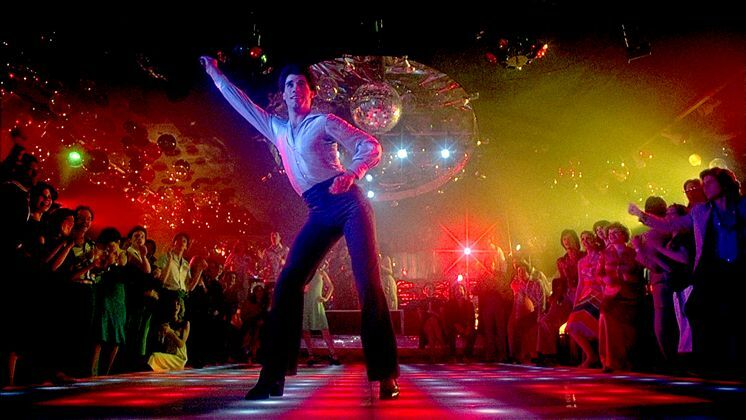 Leading colocation firms are increasingly embracing the power of interconnection and collaboration on their own campuses in what I like to call “The Disco Ball Data Center”. The Disco Ball Data Center is all about making a colocation facility a dynamic platform with rich amenities that include not Vance Mcdonald Jersey just the diverse connectivity that carrier neutral sites are well known for but also multiple options of direct connect technology services. Such facilities then become much more valuable than just the often Spartan and utilitarian purposes of their technical designs. Being able to connect to your service providers and your customers directly within the same building or via an interconnection platform between sites in separate geographies can have major performance and financial benefits. With the invisible Disco Ball above head, organizations looking to provide great end user experience can really get down together dancing to the sweet music of efficiency and effectiveness. Connectivity and Colocation Veteran Kevin Knight and VP of Consulting Services for Kiamesha Global, [icon name=”linkedin” size=”18px” link=”https://www.linkedin.com/profile/view?id=10014302&authType=OUT_OF_NETWORK&authToken=SZJY&locale=en_US&trk=tyah2&trkInfo=tarId%3A1405561342186%2Ctas%3Akevin%2Cidx%3A1-5-5″] has been in the middle of the developments and really paints a great historical picture of how we arrived at this point. “With recent announcements like the Equinix / Net App Hybrid Cloud Partnership becoming an almost daily occurrence, interconnection is clearly the hot topic in the colocation world. What many in Vance Mcdonald Authentic Jersey the industry may not be aware of is that interconnection has for many years, been one of the driving forces behind the development of colocation as we know it today. Many legacy colocation facilities, like 120 E. Van Buren in Phoenix, AZ, started out as interconnection points during the AT&T divestiture. In order to provide court ordered interconnection to new inter-exchange carriers, AT&T allowed the new IXC’s to connect at designated locations in major hubs around the country. Later, many of these buildings Vance Mcdonald Womens Jersey were sold to companies like Digital Realty and Equinix to be used as network neutral collocation facilities which then provided their clients with a vast array of carriers to choose from. fThe development of internet exchanges provided for a different type of interconnection. Through the efforts of former Digital Equipment Corporation employees like Jay Adelson (who then went on to found Equinix) and Al Avery, in 1996 the Vance Mcdonald Youth Jersey Palo Alto Internet Exchange (PAIX) was created. The PAIX facility was established as the first major carrier-neutral Internet exchange point, providing connectivity from multiple fiber providers. PAIX is now owned by Equinix. Adam Myers [icon name=”linkedin” size=”18px” link=”https://www.linkedin.com/profile/view?id=2673408&authType=OUT_OF_NETWORK&authToken=D4ud&locale=en_US&trk=tyah2&trkInfo=tarId%3A1405560732456%2Ctas%3Aadam%2Cidx%3A1-1-1″], President of Telesource Communications Inc. (www.telesourceinc.com) sheds further light on how the Disco Ball Data Center came about. “When Telesource opened our doors in 1997 providing carrier neutral solutions the overwhelming majority of our customers operated exclusively in-house data centers and went it alone in terms of managing their own interconnections to providers and customers. While the original telco data centers provided some advantages over the in-house solution they were deficient in terms of power and cooling facility infrastructure as well as diversity of access. It looks like the Disco Ball Data Center is just getting going and the only thing certain is that further change is ahead of us. So while the server, network, storage and facility technologies will surely evolve and amaze – an ever more vibrant and dynamically connected, collaborative platform is surely the path forward. Those that choose not to follow it and continue to stay out of the dance may find it increasingly difficult. iland, a leading enterprise cloud infrastructure provider, announced the findings of a new global survey conducted by Enterprise Management Associates (EMA) and commissioned by iland. The survey asked more than 400 professionals across the United States, Europe and Asia-Pacific to share their experiences with IaaS providers and revealed that Roger Craig Jersey while tech giants fight cloud wars, customers are suffering from overwhelming cloud failure rates and multiple unexpected challenges. Respondents used an average of three cloud vendors, indicating an ongoing effort to find the “right” cloud Roger Craig Authentic Jersey solution, risk mitigation policies that require the diversification of providers, department-level fragmentation, and no pressing need to standardize on a single Roger Craig Womens Jersey vendor. In addition to commonly discussed cloud benefits like cost and rapid scalability, 49 percent of respondents view disaster recovery as a key advantage to hosting workloads in the public cloud. Customers of VMware vCloud-based service providers report the highest success (67 percent) and lowest failure rates (33 percent), defined as stalled or unsuccessful (tried but failed) adoption. With Roger Craig Youth Jersey data centers in the U.S., U.K. and Singapore, iland delivers proven Roger Craig Kids Jersey enterprise cloud solutions that help companies do business faster, smarter and more flexibly. Unlike any other provider, iland’s technology and consultative approach mean anyone–regardless of expertise, location or business objective–can experience the benefits of a hassle-free cloud. From scaling production workloads, to supporting testing and development, to disaster recovery, iland’s secure cloud and decades of experience translate into unmatched service. Underscoring the strength of its platform, the company has been recognized as VMware’s Service Provider Partner of the Year, Global and Americas. Visit www.iland.com. In the aftermath of the START-II arms control treaty, some of the USA’s nuclear-powered Ohio Class SSBN nuclear missile submarines were converted to become long range conventional Ray-Ray Armstrong Jersey strike and special operations SSGN “Tactical Tridents.” Their 24 Trident II D-5 nuclear ballistic missiles were removed and replaced with up to 154 Tomahawk cruise missiles, plus Ray-Ray Armstrong Authentic Jersey space in the sub for 66-102 Special Forces troops. In the aftermath of dwindling profit margins based on supporting a legacy direct sales model in the late 1990’s, all the major IT, Telecom, Datacenter and Cloud companies either revamped or started their indirect, Channel Partner programs. With greatly reduced overhead and shifting focus from direct to Channel Ray-Ray Armstrong Womens Jersey Programs, service providers have been able to concentrate on Ray-Ray Armstrong Youth Jersey product innovation, service delivery and customer service. Channel Partners are the new masters of the IT-Telecom marketplace in Ray-Ray Armstrong Kids Jersey providing neutral design, procurement, project management, implementation and on-going management services. By utilizing a Channel Partner, you’ll be able to focus on your core business and accomplish your mission. Many of us pushing our grey matter to the limit in the fast-paced Information Technology World struggle to keep the pounds from accumulating around our midsections as we spend so much of our time and energy in strategy meetings, white-board sessions and punching away at our keyboards, tablets and smartphones. Not easy to keep in Thor-like condition with all this going on. What about our IT environments themselves? Despite our best efforts and intentions are we doing what we should to keep them toned and in peak condition? If you are running your own in-house data center it can be tough to keep it in Rashard Robinson Jersey shape. With concerns over power and cooling capacities and redundancies, oversizing power and cooling infrastructure commonly leads to permanent bloat and overspend both in capital and operating expense. Pre-planning everything out for facility needs in a modular fashion ahead of time is the best way to achieve high efficiency but you really need to have pretty sizeable scale to go that route. Even running in super-efficient colocation facilities it is very common to see extra weight and Rashard Robinson Authentic Jersey simply wasteful spend in contracts. Colocation customers concerned about not having enough to accommodate future growth all too often buy far too much up front versus negotiating flexible, scalable terms with their provider. Why pay now for something that can be contractually guaranteed in the future? Infrastructure Management Veteran, David Feller [icon name=”linkedin” size=”18px” link=”https://www.linkedin.com/pub/david-feller/3/198/85″] knows full well the challenges of keeping the physical infrastructure from getting out of hand. Another decision that an organization must weigh is whether to continue with a particular hardware roadmap (vendor growth path), and what technology decisions that path requires. When and how that vendors’ changes affect your current capacity and growth strategies can contribute to premature /over purchasing of current technology. However, changing a technology direction often contains hidden costs for an organization. Neither of those additional costs are something that an IT Director or CIO wants to occur, and it highlights the criticality of technology upgrades/changes must be made as a business decision, not an IT decision. 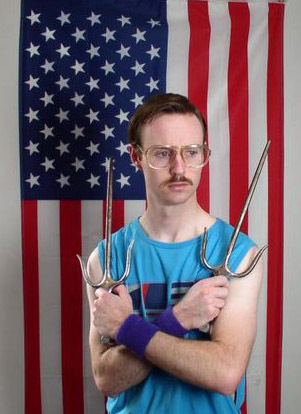 Adam Myers [icon name=”linkedin” size=”18px” link=”https://www.linkedin.com/profile/view?id=2673408&authType=OUT_OF_NETWORK&authToken=D4ud&locale=en_US&trk=tyah2&trkInfo=tarId%3A1404240125259%2Ctas%3Aada%2Cidx%3A1-1-1″], President of TeleSource Communications, Inc. (www.telesourceinc.com) has seen all sorts of simply unfit and inefficient networks in his over 17 years of helping customers procure, implement and manage the right network solutions. So whether it Rashard Robinson Youth Jersey is keeping those extra pounds off our own midsections or helping keep those IT environments in shape it really all starts with acceptance that there is a problem that we have the power to solve. Having great communication and collaboration with the business units to help us understand what Rashard Robinson Kids Jersey our IT environments will need to produce is where it starts. From there making sure that all IT stakeholders understand that being efficient at all levels is going to help us get more and do more for the users we serve and ultimately ourselves.